Stimulate yourself with the combination of Green Aventurine, Tiger's Eye, Carnelian, and Clear Quartz. Carnelian aids in balancing sexual energy, bringing more devotion, love and honesty into your life. It aids in self-trust, overcomes negativity, and calms anger. Clear Quartz is an energy amplifier which helps regulate and release energy. 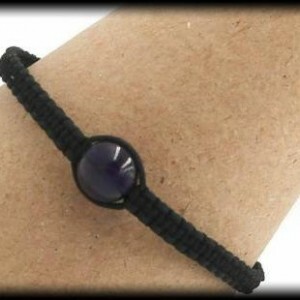 It is a great stone for unblocking energy and attunes you to your spiritual purpose. Green Aventurine, the "Stone of Prosperity", helps with indecisiveness, brings understanding, stabilizes one's state of mind, calms anger, and brings together intellect and emotions. Tiger's Eye brings out integrity, assists in accomplishing goals, promotes clarity of intention, while also allowing you to open your intuition and stabilizing your energies. Due to it being an extremely positive stone, Pyrite stimulates the flow of ideas, aids in planning business concepts, overcomes feelings of inadequacy, releases anxiety, boosts self-worth and self-confidence. 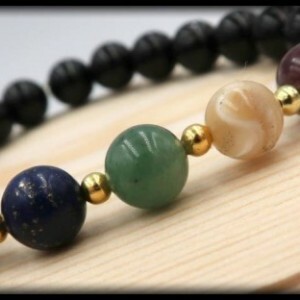 This bracelet is created with 8mm beads of Green Aventurine, Tiger's Eye, Carnelian, Clear Quartz; Pyrite Spacers SIZING INFORMATION Please measure your wrist with a measuring tape to ensure the most accurate measurement. If you do not have a measuring tape, you can also use a string by wrapping it around your wrist and then cutting the piece of string. After you have your cut string, place it alongside a ruler and write down your measurement. To ensure a perfect fit, please had 0.5 inch to your wrist measurement, if you want a little room please add .75 inches to your wrist measurement.